There are numerous reasons why pupils may be too small, too big, or inconsistent with each other. Today, we will mention a few causes of miosis or pinpoint pupils. If you search the internet, you can find numerous mnemonics that may help (“CPR ON SLIME” is even one!). The ideal way to measure pupil size is in dim lighting and using a bright light. You should shine the light from below the face while they are looking at an object behind you. Normal pupils are between 2-5 mm in bright light and 4-8 mm in the dark. They should be equal and move briskly. Constricted pupils (miosis) are less than 2mm. Dilated pupils (mydriasis) are more than 7mm. 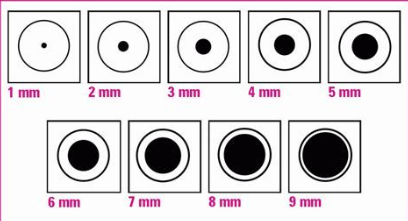 This means that in the correct setting, the pupils measure less than 2mm or larger than 7mm. A patient in bright sunlight, with pupils that are 7mm could be considered too large for the situation. The most commonly remembered cause of miosis is opiate use. From morphine to heroin and Fentanyl to Percocet and codeine, these medications can cause the pupils to be smaller than 2mm. This is especially true in an overdose situation. But the narcotic overdose requiring naloxone will also cause altered mental status/unconsciousness and respiratory depression requiring ventilatory assistance. Other medications such as phenothiazine, lomotil (diphenoxylate), clonidine, barbiturates, clozapine, eye drops, GHB, antipsychotics such as olanzapine (Zyprexa), and valproate, can also cause miosis. There are numerous Alzheimer’s medications such as tacrine and donezepil and cholinesterase inhibitor medications used to treat myasthenia gravis which can also cause tiny pupils. Nerve agents (sarin, VX) and organophosphate insecticides can cause miosis. Certain poisonous mushrooms and nicotine poisoning can present with similar symptoms. All of these substances have cholinergic effects and will likely have SLUDGEM symptoms such as increased sweating, bronchial secretions, diarrhea, GI distress, vomiting, salivation, and tearing. There are numerous lesions that can lead to miosis. Some of them will not include unconsciousness such as Horner’s syndrome, chronic lesions to the rostral midbrain from MS, Lyme disease, chronic alcoholism, etc. and lesions to the dorsal midbrain. Argyll Robertson pupils are usually unilateral and due to syphilis or rarely, diabetes mellitus. A pontine stroke or hemorrhage is often a cause of bilateral miosis accompanied by a sudden loss of consciousness. It may be accompanied by spastic shaking or jerking that can be mistaken for seizures. These brainstem strokes account for only about 7% of ischemic events but cause worsening neurologic issues. Other symptoms can include vertigo, dizziness, and headache. They can also have slurred speech and appear intoxicated. Neurosyphillis, very deep sleep, and anterior uveitis (inflammation to the middle eye layer from trauma or infection) can also cause miosis. Aging can also cause your pupils to become pinpoint or smaller. Senile miosis occurs as the eyes age and the dilator muscles atrophy. This usually starts in your 70’s and above but can be worsened with medications that also cause constriction. If you have a patient with a known opiate overdose with apnea or respiratory depression and pinpoint pupils, control their airway and assist ventilations with BLS procedures and proceed with administration of naloxone. If you patient is maintaining their airway, respirations, rate and oxygen saturations, please continue to assess and monitor the patient. Naloxone may not be needed unless their status declines. If an ALS airway is inserted, do not administer naloxone. If there are no obvious opiate sources, begin to consider alternative causes of miosis—are you checking the pupils in a dimly lit place? Are they truly 2mm or less? Do they have apnea/respiratory depression? Do they have other conflicting signs and symptoms? Does the patient have other medical conditions or take medications that can be the cause or miosis?